hippos | Meghan Kelly Teles! The fourth American member of our group rolled in and we headed to the main matatu station in the morning to catch a bus to Lake Naivasha. The matatu had an amazing interior and friendly patrons. I sat in the back with a family of 5 ranging from age 4 to 20. The 4 year old sat on my lap much of the ride and spoke to me in Swahili while I chatted with the college student about her pursuit of a degree in international business. This was my favorite matatu ride of the trip! Snapped this shot before the matatu was fully loaded! As we departed Nairobi, we had a great view of the Rift Valley, the birthplace of mankind. Making it to Naivasha, we had a $2 meal of chips masala (French fries with spices) and then were picked up by the son of the owner of the house we rented – a beautiful house with a view of Lake Naivasha from the roof patio. 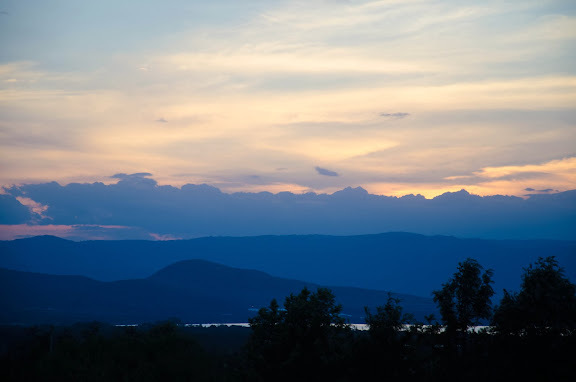 Sunset from the roof patio over Lake Naivasha. We made plans to bike in Hell’s Gate National Park the next day and do a boat safari the following day. Since we had Cindy, our plan was to eat traditional Kenyan meals each night. The first night we had Ugali, a favorite of many Kenyans. It is a finer and whiter version of polenta that you form into cups and eat vegetables with your hands. 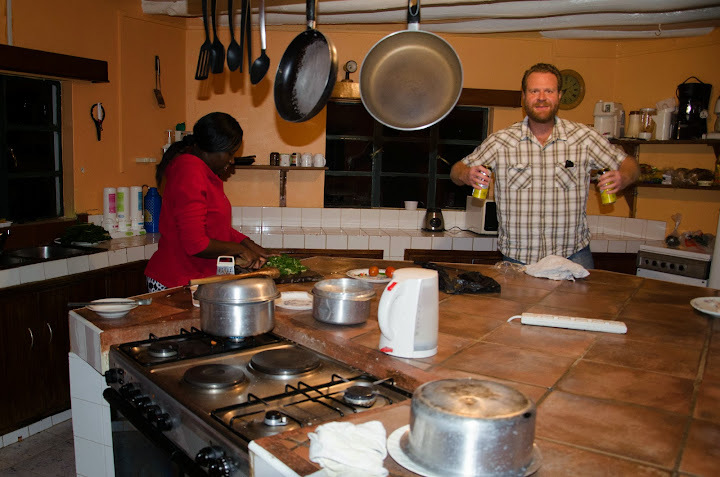 The 2nd night we had a chapati making party which is now my favorite Kenyan food – Ugali, not so much! 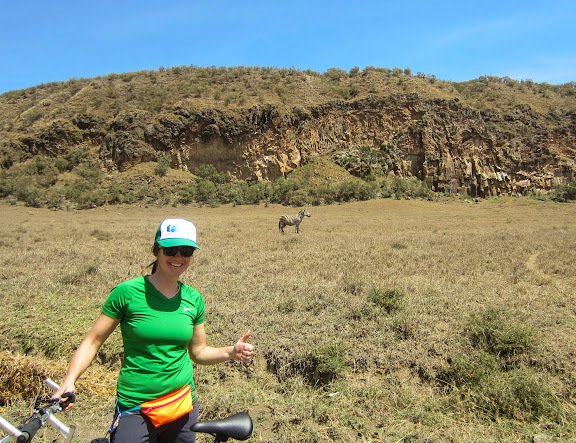 We rented bikes on the road to Hells Gate to have our first National Park experience of the trip. National parks are expensive in Kenya and you pay in US dollars. This one was $25 per day. The bikes were $10 for the day, no deposit required and were a selection of Walmart and Kmart bikes. We were told if we got a flat tire or any other mechanical problem, just find another bike on the side of the road and take that one. HA! So, we were off on a 10 km ride past zebras, gazelles, water buffalo, and warthogs. We stayed on the lookout for giraffes, but didn’t see any and end our ride at a short hike into the gorge which was a bit disappointing in that there was trash in multiple places. I’d skip that if I were you! Biking back, we got to ride “brown pow” as the rain came down and didn’t stop until we were back at the park gate. The rain seemed to make the zebras shine though and in Africa rain is a blessing, so we were off to a great start. 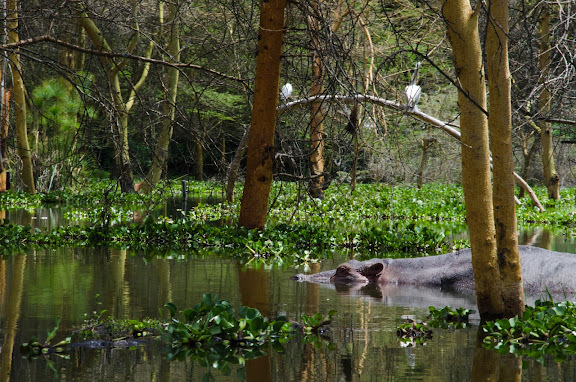 The next day we caught a boat out to Lake Naivasha to look for hippos. We spotted some right away and wondered if they’d attack us in our suspect vessel. Shhhhh…. do not wake this guy up! 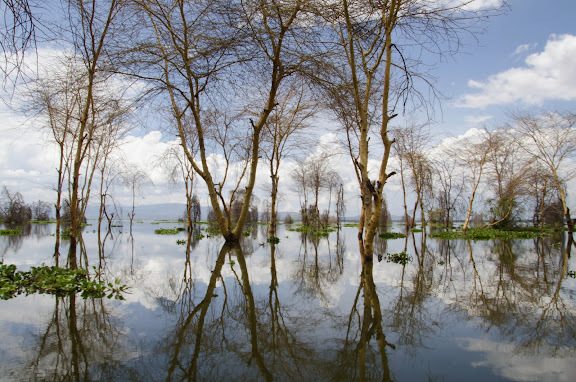 Being on the lake was beautiful, trees grew directly out of the water and the Africa sky reflected on the still water. 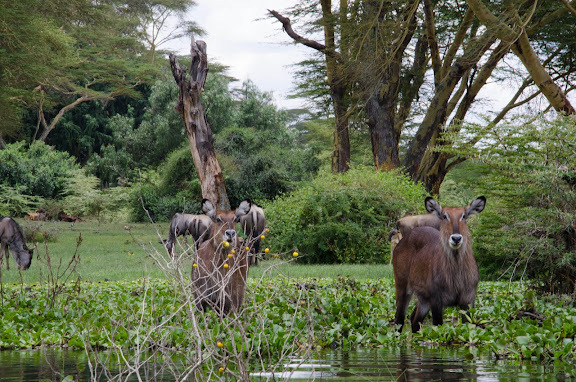 We also spotted water buck which are really cute, wildebeest, water buffalo, and colorful birds. The 1 hour boat safari was only about $8 per person and definitely worth it. 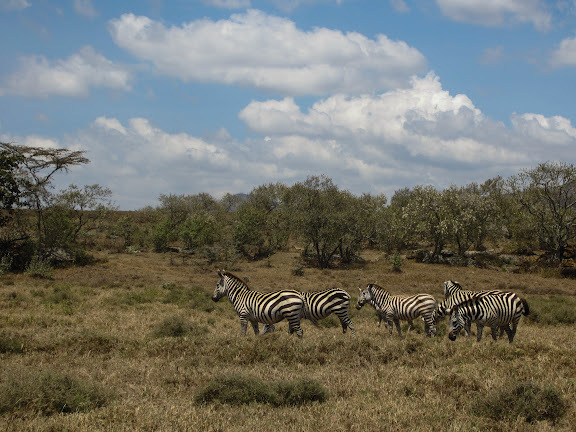 Naivasha is a quick Nairobi get away that is definitely worthy of a visit.